I’m working in the User eXperience Command Centre. It’s a relatively new function in DWP Digital that we are maturing-out to be a 24/7 Command Centre that will give us a complete picture of the status of our IT systems and services. In the IT Operations Management team, we ensure that the IT services we provide are available, efficient and functioning smoothly for both our internal DWP users and external citizens. We deliver this through creating, supporting and monitoring the infrastructure, computing and network environments. Operations engineers are a key part of the delivery, supporting the applications and infrastructure in areas such as hosting, networks and tooling, but also in wider disciplines such as transitioning change, resolving incidents and problems. I’m currently involved in bringing event monitoring to life. I’m leading a team of analysts monitoring key user services. This includes existing legacy, new digital and Cloud, and working on projects such as expanding the monitoring of our WiFi network availability and performance. There’s so much pace and transformation within DWP Digital, it’s great to be involved in the full lifecycle of change, from the build through to actually monitoring them in live. 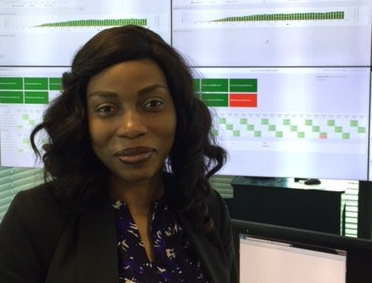 I’ve been in the role for nine months now and, prior to this, I worked for HSBC Bank and Fidelity Bank Plc as a Technical Specialist and IT Analyst respectively. I believe I’ve joined the DWP Digital team at the right time. From the job advert to the interview, I was given all the information I needed about on the department’s digital transformation plans, to know I would be happy joining the challenge. My background, working in organisations where similar process are already in place and working, is helping me to be part of the team that’s bringing DWP’s goals to life. I’ve been welcomed by great managers and supportive colleagues. We have a shared goal and positive outlook and I’ve found my new colleagues are committed to the delivery of effective outcomes. Together, we’ll continue to deliver improvements for a better user experience. Over the past few months, I’ve learnt a lot. I’ve been exposed to some new technologies through structured, unstructured and hands-on training. Given the scale and pace of change, I’ve been given lots of opportunities to take on and deliver tasks and to bring some of my previous experiences on board. I’ve seen an impressive level of people development from the department to grow and up-skill employees using the latest technology and approaches. The big project I am currently involved in is the migration of services to new data centre environment and the introduction of new tooling. We’re building up the numbers and capability of our Shift Analysts teams and there are opportunities for a number of specialist skills within the project and IT Operations Management. If you’re thinking of joining us, it’s a great time to get involved. Find out what’s happening in DWP Digital: Subscribe to this blog, follow us on Twitter @DWPDigital and look at our LinkedIn page to see our latest jobs.